Two friendlies in the past week for Cliffe FC, both ending on the wrong side of a 3-1 scoreline. Heworth Green winning Tuesday, and Cawood winning Saturday. Tuesday, Heworth Green made the trip to Oxen Lane. They took an early lead before Dan Smith finished of a chance for 1-1 before half-time. Heworth led 2-1 at the break, before scoring once more in the second half, 1-3. Ally Harris made a superb save towards to end of the match to cement his man of the match award. 1-3 FT.
Jackson Lucitt’s Sunday team begin their season with a real welcome to the top division, as they travel to last season’s champions, Wigginton Grasshoppers, in league senior cup competition. Saturday, the first team suffer another defeat, away to Cawood, and yet another frustrating result considering the manner of improving performance. Cawood winning 3-1. 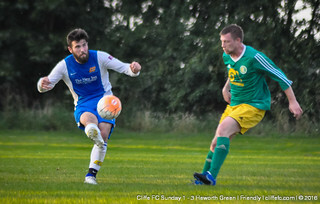 A mad 100 seconds on the quarter hour mark saw Cliffe go two goals behind, both goals from close range. 2-0 at the break. Connor Potts scored a deserved goal, to make it 2-1. A Cawood freekick that went under the wall made it 3-1. Cliffe looked to narrow the deficit, but Kev Taylor saw his penalty hit the post and go wide, which would have made Cliffe’s string of five corners near the end of the match a little more testing for Cawood. 3-1 was the final score. Malcolm Bryce’s squad have a few weeks until season starts, a derby to start the league season away to Hemingbrough United on 17th September. Next Saturday, 3rd Sept, both Cliffe FC first and reserve teams are in action, away to Selby Olympia and Thorpe United Reserves respectively. Cliffe FC, whilst much improved from previous weeks, suffer a narrow 2-1 defeat to Goole AFC’s academy side. With the Cliffe Playing Field Association Yorkshire Beer Festival taking place at The New Inn over Saturday and Sunday, this was Cliffe FC’s solo fixture of the weekend. With a end to end wind, Cliffe played the first half with the wind at their backs. With some good football played and chances created, the score remained 0-0. Any Goole attack was thwarted by the back four and it remained goalless at half-time. Manager Malcolm Bryce told his squad, any more wasted chances from the home side and they would surely be punished. As the script was written, Goole opened scoring early in the second period, pouncing on Cliffe giving the ball away, and then opening scoring with their first chance of the half, 0-1. Cliffe bounced back quickly and worked a chance that saw Sean Gallagher ghost past his marker and slot the ball under the ‘keeper to his left, 1-1. Cliffe repeated the same mistake to give Goole the lead shortly after, giving the ball away in the middle third, and then Goole switching the their left wing to finish for 1-2. For all of Cliffe being on top during the game, Goole held out for a win, Sean Gallagher having a second goal wiped out for offside in the last minutes, 1-2 FT.
Much improved performance from Cliffe, a step in the right direction as preparations continue for the season ahead, lessons learnt and positive attitude throughout. Next week, they face Cawood away. 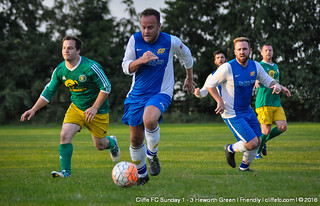 The Cliffe FC Sunday team are in action Tuesday night, at home to Heworth Green. One win a-piece for the Cliffe FC vs. Farnley Sports double header, Cliffe losing the first team game 3-0, Cliffe Reserves then winning 6-2. Sunday saw a humbling 8-2 defeat at Hambleton. Saturday 1pm KO saw Cliffe FC host West Yorkshire Amatuer Premier side, Farnley Sports. Farnley had two penalties in the first half, taking the lead in the first ten minutes, 0-1. The second penalty had to be taken twice, first Dave Laverack made a strong save to his left to only see it have to be re-taken, the second attempt was dragged wide. Nigel Horner came closest for Cliffe, unable to get a toe on a cross flashed in front of goal. 0-1 HT. Old habits died hard in the second half, but Farnley scored once more for 0-2. Cliffe improved in attitude toward the game but could get themselves back into the game. A Farnley volley deflected into the net for 0-3 at the final whistle, FT. Improvements must be made in the coming weeks, Manager Malcolm Bryce satisfied with some phases on play but ultimately results need to follow, and soon. Next Saturday, Goole AFC’s Development side are the visitors. The 3pm KO saw a super performance from Cliffe’s second string to win 6-2 against Farnley Sports Reserves. Young Kieran Gallagher was the star of the show with a hat-trick, the impressive Max Dutton scored the goal of the game from the edge of the box. Glynn Richardson and Nathan Leach opened scoring for Cliffe in the first half. Cliffe eventually cruised to a classy win after a tough first half, and frustrated their Farnley opponents. With a narrow defeat to higher division opponents last week, and now a dominating performance against a robust opponent. Another test next week as higher division Riccall Reserves visit Oxen Lane. A second half collapse sees Cliffe humbled at Hambleton. The HT score read 3-2, Scott Birch and Kieran Dinsdale with the goals for Cliffe, Cliffe leading 1-0 and 2-1 in the first half. Ally Harris in Cliffe’s goal picked up an injury, so could not continue second half, and not having a recognised ‘keeper saw a number of avoidable goals conceded as Hambleton ran riot. 8-2 the final score.